Follow along as participants in the cruise provide updates and reflections on their experiences, the science, the technology, and other elements of the expedition. 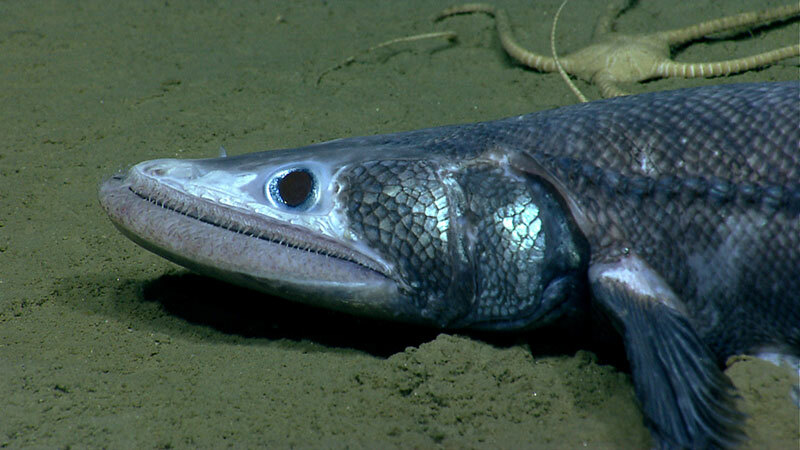 As the manager of the Ocean Explorer website and the person posting about NOAA’s Office of Ocean Exploration and Research on Facebook and Twitter, it has been extremely gratifying and exciting to watch the live video feeds from the Okeanos Explorer Northeast U.S. Canyons 2013 expedition catch people's attention. 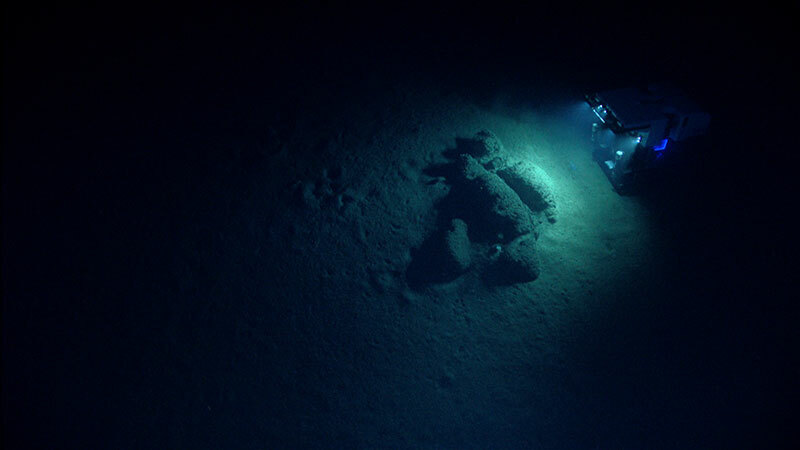 During the long summer days of July and August, NOAA Ship Okeanos Explorer, remotely operated vehicle Deep Discoverer, and the cadre of scientists and technicians both aboard ship and ashore have had the rare opportunity to visit more than 10 submarine canyons along the U.S. Atlantic continental slope during the Northeast U.S. Canyons cruise. While some of these canyons have been visited many times in the past, the rest remained virtually visually unexplored. Submarine canyons, undersea "sinuous valleys" indenting the continental slope off the central and northeastern United States, are one of the East Coast continental margin's most prominent features. Some of these canyons are tens of millions of years old, kept open by periodic erosional forces generated by many processes. The idea of telepresence is certainly not a new one. It’s an almost inevitable conclusion of our inborn desire to explore, our skill at crafting tools, and our relatively fragile physical nature. The desire to explore, to traverse distance and time, is a human drive trumped only by our basic survival needs. And even then there are many who would (and still do) risk life and limb to see what’s beyond the hill, above the sky, and below the sea. 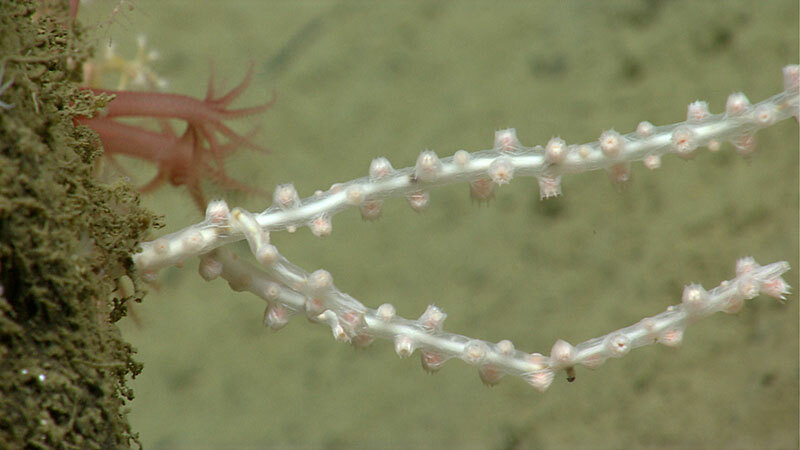 If you have been following along on the live dives of the NOAA Ship Okeanos Explorer Northeast U.S. Canyons Expedition, you have likely heard several times the cry of “Bamboo coral!” With a little practice, most bamboo corals can be fairly quickly recognized in deep-sea video. 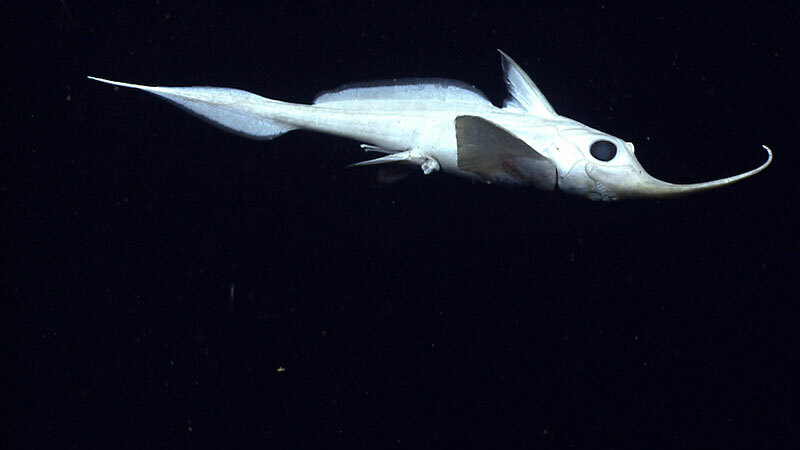 However, such an identification only begins to scratch at the surface of the actual biodiversity we are seeing. 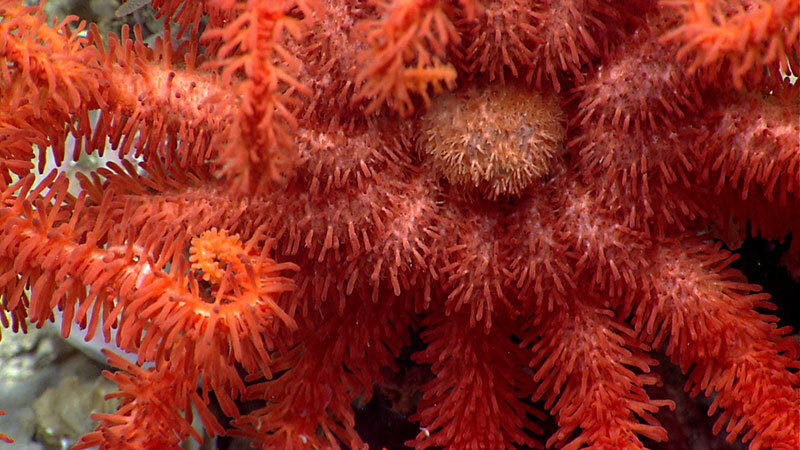 So what is a bamboo coral [and why are we so interested in them]? During this expedition, we explored Mytilus Seamount on two separate dives, one on the north side and one on the south side of the seamount. 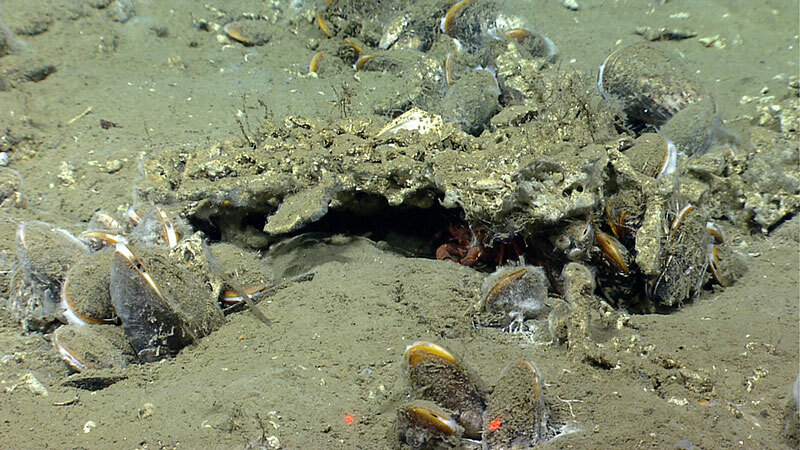 Mytilus is part of the New England Seamount Chain and is one of the deepest (over 3,000 meters at the base) and least-explored seamounts in the U.S. Exclusive Economic Zone. Earlier expeditions had conducted some work on Mytilus, but we still have a great deal to learn. Working with a telepresence-enabled ship like NOAA Ship Okeanos Explorer is a bit like 'drinking from the firehose' when it comes to digital information. The ship and crew battle wind and waves, but here on ‘the beach’ we battle with overloaded networks and overheated computers. We deal with big data in real time. The steady stream of high-resolution images, water chemistry, and navigation from the remotely operated vehicle require high bandwidth (4 mb/sec) and push the limits of our technology. 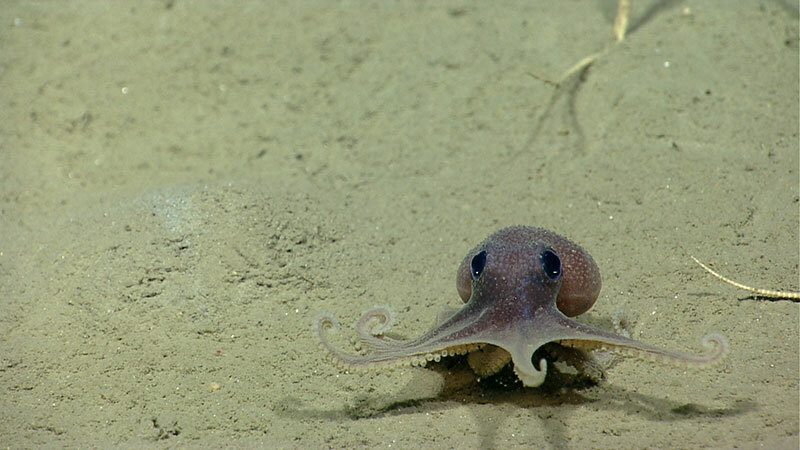 From July 8-25, the Northeast U.S. Canyons 2013 Expedition explored diverse habitats and geological settings of the deep canyons region off the Northeast United States. 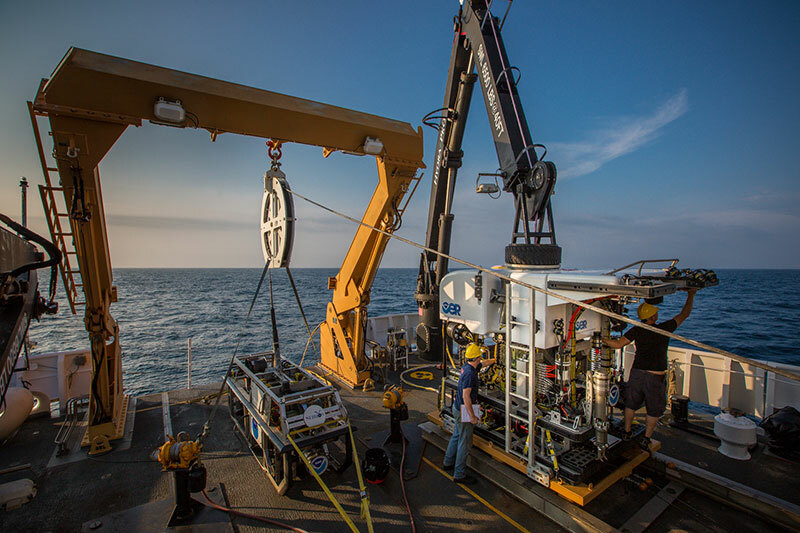 The remotely operated vehicle (ROV) Deep Discoverer completed 16 dives to depths ranging from 500 to 2,200 meters along the continental slope of the northeast U.S. 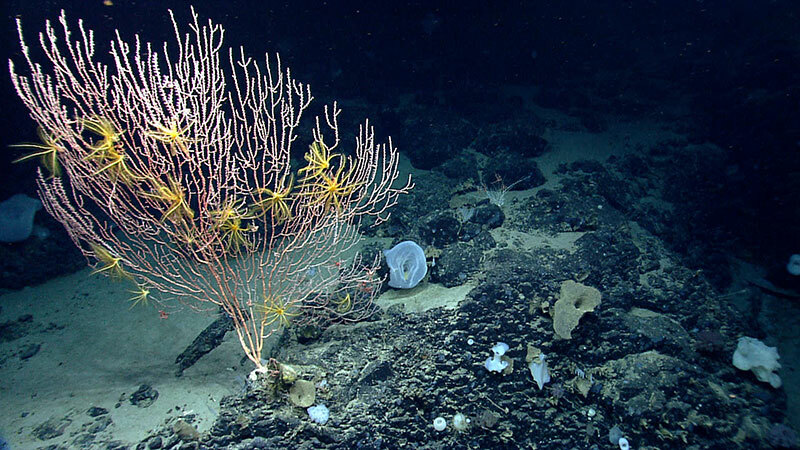 Focused exploration of the deep seafloor occurred between Block to Hydrographer Canyons. 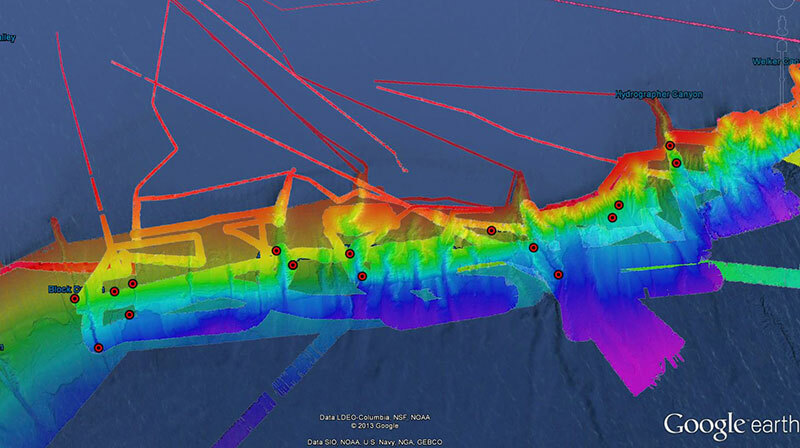 Throughout the cruise, previously collected multibeam data was used to plan all ROV dives. Gridded bathymetry data were viewed in collaboration with the onshore science team, and dive tracks were planned and plotted in 3D and shared with the team. Applying telepresence to an oceanographic expedition alters traditional day-to-day operations. With a science team that can span the globe, the work never stops. 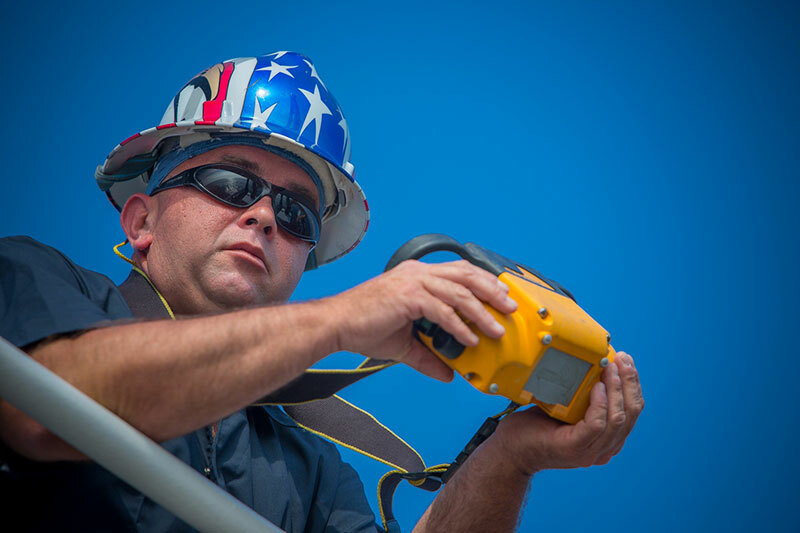 Live video, audio commentary, and regular data uploads provide new datasets and information to shore 24 hours a day. 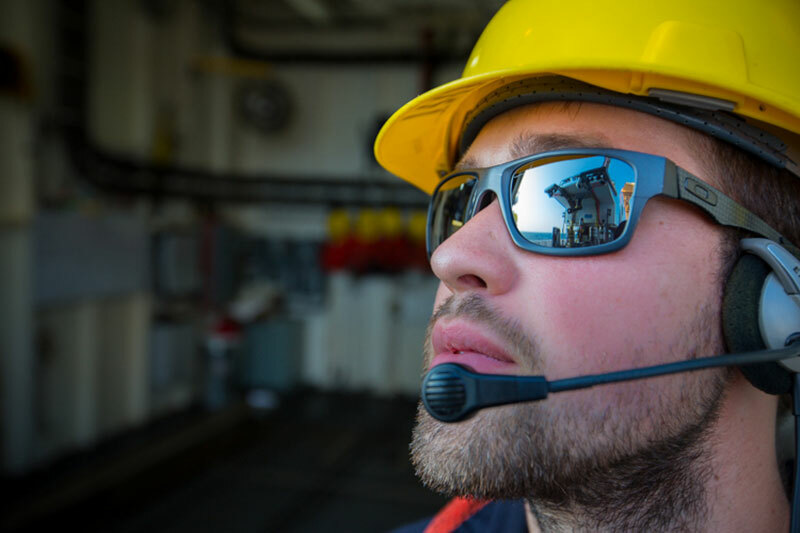 Shore-based teams remain in constant communication with the vessel and each other via email, instant messaging (IM), and an IP-based intercom system. All of these mechanisms are used to plan daily operations as well as to participate in the real-time discoveries. 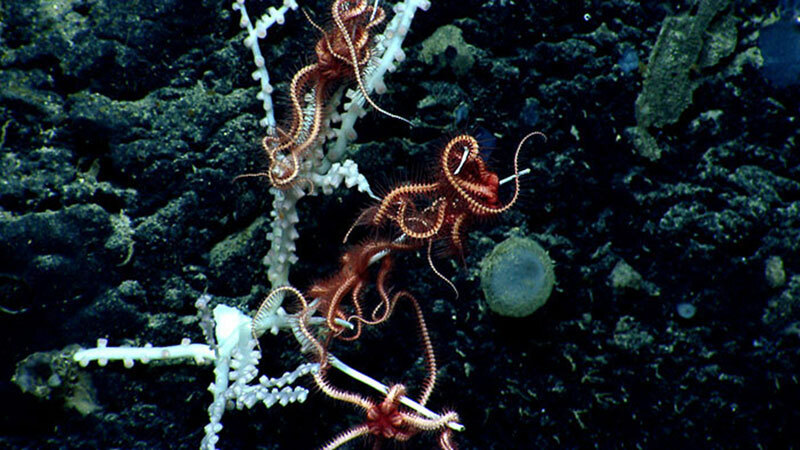 To say that joining NOAA Ship Okeanos Explorer for the Northeast U.S. Canyons 2013 Expedition would be a new and unique experience is an understatement. This cruise has presented me with many firsts – my first time traveling to Rhode Island, my first time seeing the Atlantic Ocean, my first time at sea for more than a day, my first time working with the remotely operated vehicle team, and soon, my first time to New York when this leg of the cruise comes to an end. I am happy to say that my experience so far has been completely positive. I am what you might call a “shutterbug,” or an amateur photo enthusiast. My friends and family will tell you that pretty much wherever I go, I take entirely too many pictures. As web coordinator for the 2013 Northeast U.S. Canyons Expedition, I have the distinct pleasure of pouring over hundreds of amazing images every evening to choose what eventually ends up on the website. What Is a Chief Boatswain? The term “Boatswain” or “bosun” originates from the 15th century. It was a term used to describe the young boy who piloted a small boat to take his captain to shore. In recent times, the meaning has expanded to describe the persons who tend to anchors, rigging and general ship maintenance. A NOAA Boatswain is a far more involved position aboard the ship. 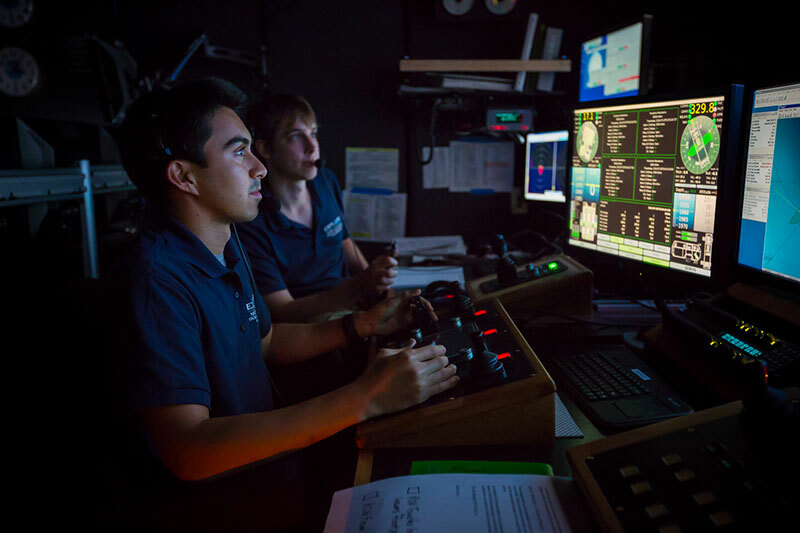 Over the past two days, the remotely operated vehicle Deep Discoverer explored steep slopes along the west and east walls of Hydrographer Canyon. 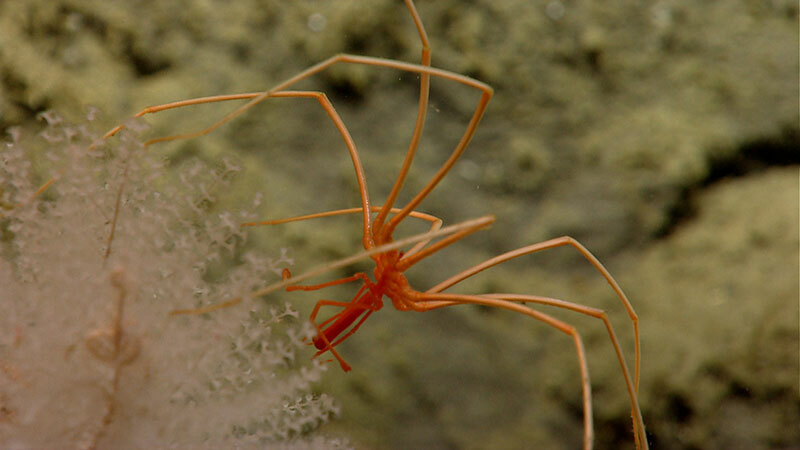 These represented the first two of many dives in a deepwater submarine canyon for the Northeast U.S. Canyons Expedition. 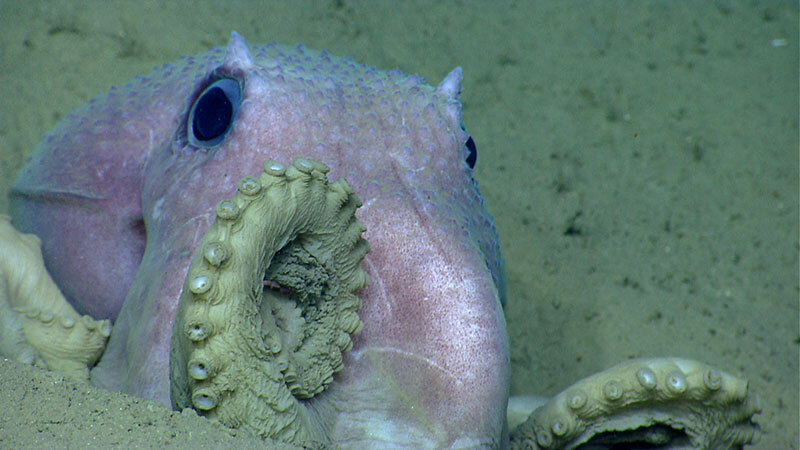 On July 11 and July 12, 2013, NOAA Ship Okeanos Explorer and the Deep Discoverer (D2) remotely operated vehicle targeted seafloor sites located about 165 kilometers south of the island of Nantucket. 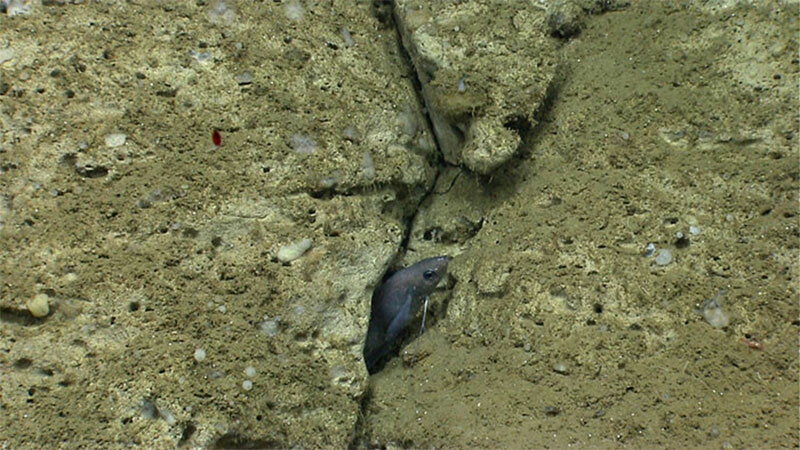 These dives were the first scientific explorations of newly discovered seeps lying at approximate water depths of 1,100 meters (July 11) and 1,400 meters (July 12). For each of the dives, D2 targeted four sites located at the base of water column bubble plumes on small ridges overlooking unnamed canyons. Dives 01 and 02 of the NOAA Ship Okeanos Explorer Northeast U.S. Canyons Expedition 2013 explored areas of interest to the U.S. Geological Survey Marine Hazard Group in Woods Hole, Massachusetts, as part of the ongoing assessment of the submarine landslides along the continental margin offshore the U.S. east coast and their potential role in generating tsunamis. NOAA Ship Okeanos Explorer departed her homeport of North Kingstown, Rhode Island, today, kicking off the 2013 Northeast Canyons Expedition. Ship- and shore-based personnel spent the day preparing for the first dive and going over safety items and equipment checks. 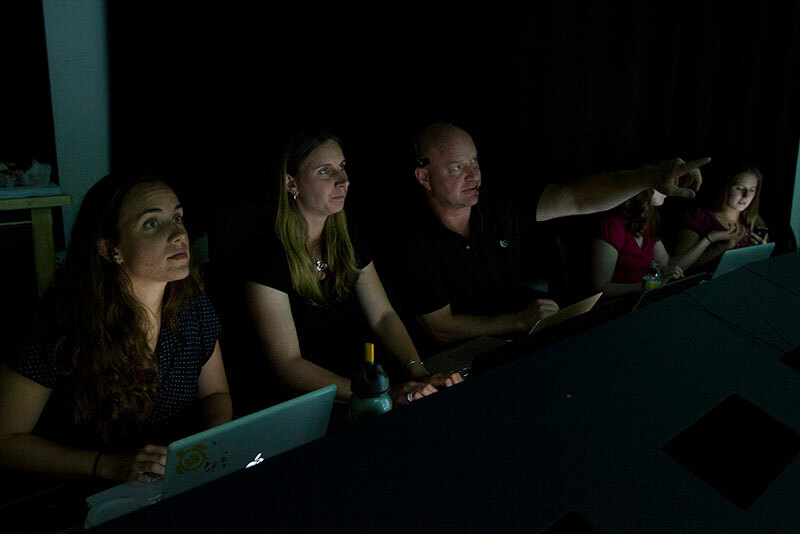 Science team members held dive-planning meetings and were trained on collaboration tools and remotely operated vehicle control room protocols.